Karl and Susan finding out from Maggie that Elly has gone to the dance marathon. Karl is angrily pacing while Susan cooks, he is trying to convince her that Elly must go and Liz must be made to face up to her responsibilities, Susan reminds him that this is impossible as she has made herself unavailable and sends him to the greengrocers to buy her a lettuce. As soon as he leaves Elly comes out of her room, she tells Susan she felt the punishment was unfair and that she is only being true to herself. Susan reminds her that while she lives in their house she is the one who has to adapt. Drew is apologising to the new tenant after she has shown him her lease, they introduce themselves. Drew remembers the old tenant Nigel keeping a spare key hidden and offers to help her up with her stuff. After they've finished he tells he about the Christening and that she should meet Ben and Libby soon. Michelle come out of her room yawning, Lyn remarks that she must be tried as it's hard to sleep at a dance marathon. Joe is angry and bans her from seeing Elly, the phone rings and he goes to answer it. Michelle thinks the punishment is unfair, Lyn says that what is unfair is that they can't trust her anymore. Joe comes back, it was his brother Mick, they're dad turned up at his place and is now coming to see them, Lyn and Joe look perplexed, they haven't seen Pat in years. Karl is fussing around Ben, Lyn arrives and gives Joe's apologies. Lyn and Susan share their frustration at trying to discipline Elly and Michelle. Libby and Drew arrive with the minister in tow, Lou is surprised to see she's a woman –Lyn reminds him that women can vote now too. 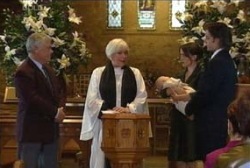 They are all introduced to the Rev Rosie Hoyland. Libby announces she's adding an extra middle name – her old editor Ian died of cancer yesterday. Karl and Susan agree it's a lovely idea. Rosie suggests getting started while Ben is still happy. Harold arrives in the nick of time. Terri is trying to get into the surgery. Darcy spots her and informs her the surgery is closed for the morning for family reasons. He tells her to come back this afternoon but she fobs him off. Rosie is making a speech, she tells the congregation that despite all its hardships, the world is still a pretty wonderful place and our children are our gift to the future. She impresses upon them how awesome a responsibility of raising a child is. Then he is christened. Joe is upset that Pat has been AWOL for 8 years. Pat apologises and Michelle comes in with their tea. Libby and Drew thank Rosie for a lovely service, Drew is disappointed his parents couldn't make it. Karl, Susan and Lou are saying to Harold how lovely Rosie is. 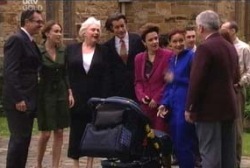 Lyn offers to take the family photos, they pause and Libby tells Elly to get in because she's family. Susan then starts winding Karl up about when he's going to give Elly her ‘marching orders'. He tells her it's not the right day. He looks irritated and they take more photos. Libby is questioning Drew about their new female neighbour, Drew reassures her that she'll really like her; Libby says she'll like her if she's into babysitting. Michelle comes over to see Ben, Karl complains that boy babies should be something other than gorgeous or cute. Lou gets Libby to open Ben's presents, it's two books; a bible (Harold's influence) and ‘Success in Business' (his contribution). Lou has also given him a large amount of shares (that I can't actually see as it is too blurry! ), everyone remarks how generous it is. Michelle and Elly are comparing notes on their punishments, they don't see Lyn behind them. LYN: How about discussion time? How about Lyn puts her point of view first? LYN: I don't know if you listened to the minister today or not, she talked about parental responsibility, the need to guard and guide our kids, helping them mature into responsible adults. She made me think a lot about the rules we set for our kids and why we set them, do you know it's so we can sleep at night knowing that we've done everything humanly possible to keep you safe, to show we love you. ELLY: And then we throw it back in your face? Is that what you're saying? LYN: That's what I'm saying, unreasonable? The girls agree to have a think about what she's said. Susan looks on thoughtfully. She's on the phone, telling someone that she went to the surgery and it was closed but that Darcy was what she expected. Lyn tells Pat it's good to see him after such a long time, she exclaims how wonderful the Christening was and then goes to make tea saying that champagne makes her dry, Joe follows her. He says that his father is there because he wants to get to know his grandchildren, but says he can't stay with them. JOE: He can't turn up after eight years and expect an instant family, no way. Drew is going into the flat with Ben while Libby carries a box a bit behind them. Terri is wearing a small white dress and heels and talking to a guy in a car. She comes over and Libby says hi but Terri goes into her flat telling her she'll catch her later.